New wireless technology makes it possible for monkeys to control a robotic wheelchair using just their thoughts, without the need for EEG electrodes on the scalp or wires connecting to an external computer. Developed by neuroscientists at Duke University, the new brain-machine interface relies instead on hair-thin microfilaments implanted in two regions of the monkeys’ brains. Using those microfilaments, the wireless BMI—a device that gets affixed to the monkey’s head—simultaneously records signals from hundreds of neurons in both regions. As the monkeys think about moving toward their goal, computers translate their brain activity into real-time operation of the wheelchair. There have been other studies involving thought-controlled wheelchairs, but most rely on EEG and a wired model along with some physical capability in the user. This wireless system could have particularly exciting implications for disabled people who have lost most muscle control and mobility due to quadriplegia or ALS, the researchers said. 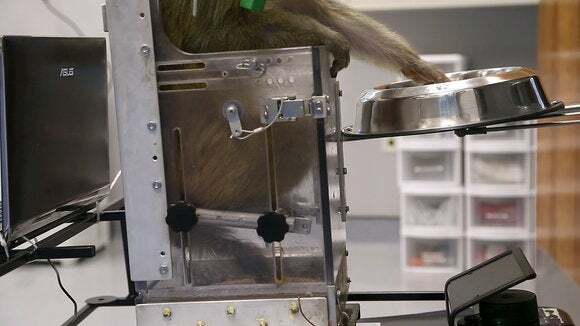 A primate navigates a robotic wheelchair toward a bowl of grapes using only its thoughts in an experiment from the Duke lab of Miguel Nicolelis. Roughly 70 percent of paralyzed patients are willing to accept surgically implanted electrodes in their brains in order to gain control over their assistive devices, the researchers said. A paper describing the interface was published Thursday in the online journal Scientific Reports. The researchers tested their system using two rhesus macaque monkeys, who were motivated by a bowl of fresh grapes. In their tests, they measured the activity of nearly 300 neurons in each of the two monkeys. Next, researchers hope to expand the experiment by recording more neuronal signals in an effort to increase the accuracy and fidelity of the primate BMI before seeking trials for an implanted device in humans.